Perhaps some people in a position of authority believe that social media is a poor method to use for reaching others with a message that includes vital information or necessary instructions. Those people need to rethink their opinion in this matter. In today’s developed world (and in parts of the underdeveloped world), social media is ubiquitous. There is no escaping it. While there are people who refuse to engage in Facebook, Twitter and other forms of digital general-use communication, their number is dwindling, and their functionality is comprised by the fact that everyone else is communicating that way. Obviously, the powerful people of the world use Twitter; President Donald Trump messages the world through that platform. The wealthy use Facebook, LinkedIn and Instagram as well. The CEOs of both Amazon and Google communicate through their social media posts. Spectrem’s biannual study on the wealthiest investors demonstrates the majority appeal of social media. The Wealthiest Americans: $25 Million Plus Investor includes updated research on the frequency of social media use and the functions social media provides to the wealthiest investors. Sixty-eight percent of $25 million plus investors use Facebook, 47 percent use Twitter and 46 percent use LinkedIn. All of those percentages indicate increases in usage from the 2016 report (Facebook 58 percent, Twitter 39 percent and LinkedIn 39 percent). Advisors can certainly use social media for the purposes of providing information on social media sites and encourage their clients to “follow” or “like” their accounts to disseminate that information. But social media is more than just reading. 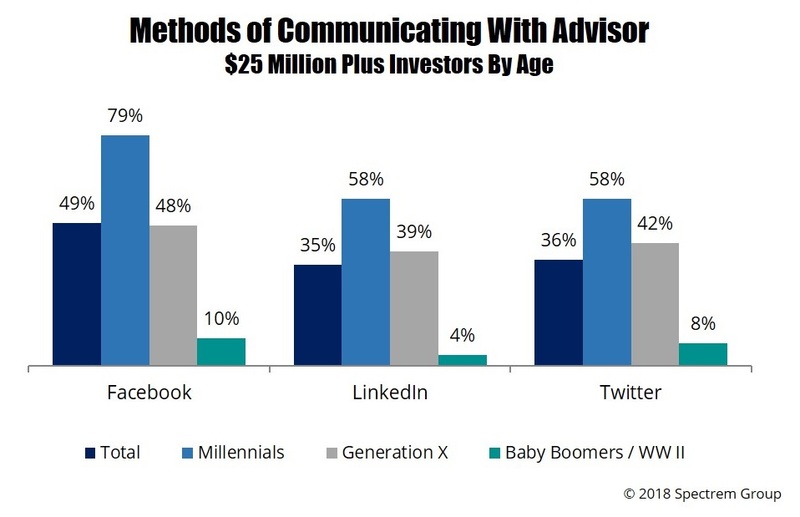 Almost half of all $25 million plus investors have communicated with their advisor via Facebook and 36 percent have done so via Twitter. That’s the average in both cases: the youngest investors (under the age of 38) are predominately communicating with their advisor in that method. Seventy-nine percent of those young $25 million plus investors have communicated with their advisor via Facebook, and 58 percent have done so via Twitter. Advisors must make certain they are fully available to all of their clients through Facebook responses, Facebook Messenger, direct messages on Twitter and other methods made available via social media sites. Such availability will likely increase communication which will increase business transactions. The usefulness of social media is only possible when knowledgeable people provide posts that include meaningful content. It is noteworthy that 73 percent of all $25 million plus investors read blogs pertaining to financial topics, and the same percentage would read blogs provided by financial advisors they know. Blogs can become long-winded; tweets cannot. Fifty-eight percent of $25 million plus investors would follow their advisor on Twitter if it is possible to do so. Because most, if not all, financial advisory firms have some level of internet presence, this topic is not about catching up. It’s about staying current and frequent on social media. Among wealthy and involved investors, there is a thirst for information, and investors prefer to get that information from reliable sources, of which their advisor is one. They often go to their advisor’s website first when looking up current event information that might impact investor decisions. The same is true of Facebook pages and Twitter accounts. It would be a shame in those investors go elsewhere for information simply because they cannot find what they are looking for when the go to your social media account.